« Celebrating 5 Years with the NEW EverWeb 2.8 Featuring Responsive Web Design! Responsive Website Design (RWD) is the headline feature of the new EverWeb version 2.8 that many of our users have been eagerly waiting for. Whilst some will be familiar with RWD, its concepts and methodology, there will be many who will be dipping their toes in for the first time. RWD offers a different approach to web design that can create a wealth of possibilities for your website. However, RWD can also be difficult to conceptualise and implement across all devices so can become a frustrating experience. This post is designed to give you a background to Responsive Web Design: What is it, what it is not, when to use it in your website design and when not to as well as the advantages and disadvantages of using RWD. Knowing more upfront about how RWD works will help you more easily develop great responsive websites in EverWeb! Your website design is automatically scaleable on any device. Conceptually difficult and difficult to learn. Can be costly in development and maintenance. Page loading times can be slower than for ‘traditionally’ designed websites. Responsive Website Design can make developing fully scaleable websites quick and easy if you have the right experience and knowledge. However, there are times when building a responsive website may not be the right choice and using a ‘traditional’ website design is actually better, particularly when a ‘free format’ design approach is required. It is recommended that you try a small test website project before developing a new RWD website project or redeveloping an existing ‘traditional’ website. In this way you will learn more about how RWD works in general and how it is works in EverWeb. If you want to redevelop an existing ‘traditional’ style website bear in mind that it will need to accommodate responsive design methods. Invariably, some design compromise will be needed which may also have advantages and disadvantages. Do not expect your existing design to look, and/or function, in exactly the same way when redeveloped as a responsive website. It is worth investing some time and effort in experimenting to see what is, and is not possible, with RWD in EverWeb. There is a learning curve, which can be quite steep for some as RWD often requires a different approach and way of thinking than you may be used to. Understanding the basics of EverWeb itself gives you a good start as responsive design capabilities have been integrated seamlessly in to the product. 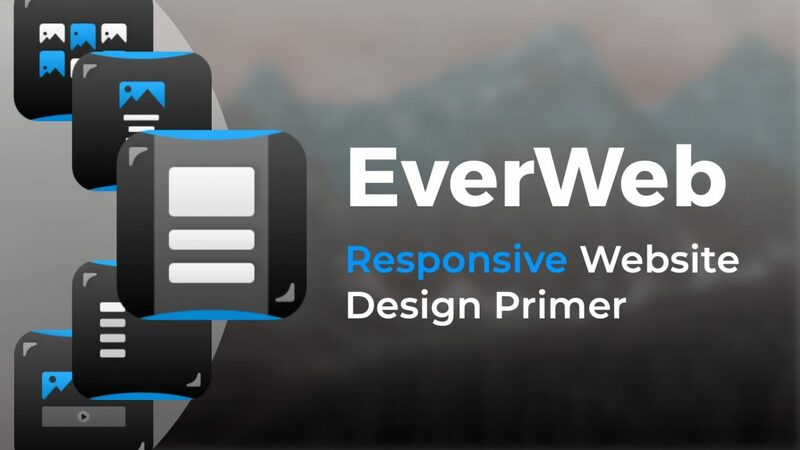 Our post blogs and YouTube videos will also help guide you on all of EverWeb’s responsive design features and how to use them using real world examples. Responsive design is structured so that objects always use the full width of the page. Full width objects are like containers that hold their own content. These ‘containers’ are stacked from the top of the page downwards, one under the other. As the page is resized in a browser, the objects within the container automatically scale and reorganise themselves within the container as its horizontal and vertical dimensions change to properly fit within the browser window. Some objects, such as the Responsive Row widget, can only be a full width object. Some objects such as TextBoxes, shapes, images and some widgets can be either be a full width or non-full width object. Some objects, such as the Facebook Like and Live Photo widgets, can only be non-full width objects. In the next post related to responsive website design in EverWeb, we start to build a responsive website in EverWeb. This entry was posted on Thursday, December 6th, 2018 at 4:48 am	and is filed under EverWeb, EverWeb, Software. You can follow any responses to this entry through the RSS 2.0 feed. You can leave a response, or trackback from your own site.